21 Ohioans are serving on Ohio Farm Bureau’s 2017 policy development committee. 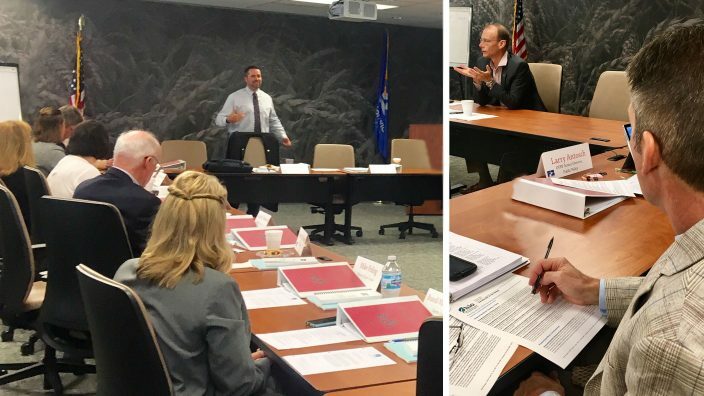 As part of Farm Bureau’s grassroots policy development program, the committee collects and organizes recommendations submitted by county Farm Bureaus and Issue Advisory Teams. The committee also finalizes the policy suggestions that will be voted on by delegates at the Ohio Farm Bureau annual meeting in December. The policy committee consists of 11 members from Ohio Farm Bureau’s board of trustees and 10 representatives of county Farm Bureaus. They are OFBF officers Frank Burkett III of Massillon, Bill Patterson of Chesterland and Cy Prettyman of New Bloomington; state trustees Wyatt Bates of Wheelersburg, Patty DeBruin of Millersport, Jerry Lahmers of Newcomerstown, Al Miller of Marietta, John Mossbarger of Washington Court House, Mike Poling of Delphos, Wade Smith of Whitehouse and Mike Videkovich of Ashville; and county Farm Bureau members Shelby Brammell of Kenton, Jennifer Cox of Dresden, Marvin Dietsch of Edgerton, Katie Farley of Englewood, Rose Hartschuh of Sycamore, Brandi Montgomery of Washington Court House, Mary Smallsreed of Newton Falls, Andy Troutman of Wooster, Rachael Vonderhaar of Camden and Ashton Walls of Mount Vernon. During its initial session the committee heard from subject experts, government leaders and Farm Bureau staff on topics such as water quality, livestock siting regulations, the opioid epidemic, energy, the federal farm bill, property rights and school funding. Committee members also visited with representatives of Central State University, Ohio State University Extension and the Ohio Fair Managers Association.